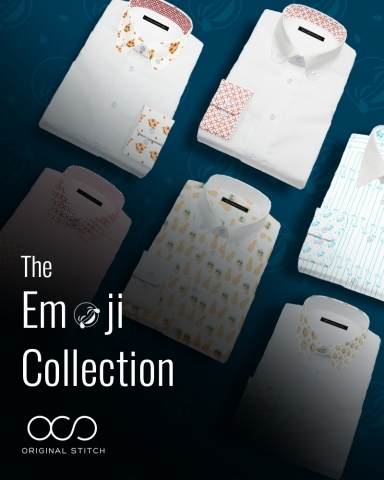 Original Stitch launches a fun new Emoji patterned collection aimed at bringing men’s dress shirts into the digital age. SAN FRANCISCO--(BUSINESS WIRE)--Emojis aren’t just for text messages anymore. Communicate your mood with Original Stitch’s newest collection of emoji-based prints – no screen necessary. The pre-launch will be held for 4 days beginning on March 21st, allowing customers early access to the unique line of fabrics. Australia, Belgium, Brazil, Canada, China, France, Germany, Greece, Hong Kong, Hungary, Iceland, India, Indonesia, Israel, Italy, Japan, Lebanon, Malaysia, Mexico, Netherlands, New Zealand, Singapore, Spain, Sweden, Switzerland, Taiwan, United Kingdom, and the United States. Sign up to receive exclusive updates surrounding the Emoji Collection. Original Stitch, founded in 2015 by CEO Jin Koh, is already an industry leader in online made-to-measure men’s dress shirts. They offer a customization platform for men’s dress shirts, both professional and relaxed, with an incomparable number of customizable options available. Being headquartered in San Francisco has afforded the team behind Original Stitch to delve into the wardrobe needs of young professionals at their finest. This insight is what puts the original in every shirt stitched. Visit www.originalstitch.com to learn more about the company or join Original Stitch on Facebook and subscribe to the Original Stitch email list to receive updates and promotions on the latest collections and news.